The plan was to sail out of the Crouch, over the sand banks and North to Brightlingsea. However, the wind had even increased a little overnight. We set out from the marina with second reef prepared, but the conditions were pretty unpleasant, and this was just on the river. Niki and I decided that it would not be safe to go to sea and so we ducked down the river Roach, which branches off the Crouch not far from the sea. The Roach is quite a bit smaller than the Crouch and has many creeks winding off from it. Our plan was to find a creek and drop anchor. This part of Essex, between the Crouch and the Thames estuary is very flat and, particularly today, windswept. There was not a great deal of shelter to be found, but we did find a nice sheltered anchorage near a seal colony and spent a relaxing afternoon watching enormous mud flats emerge as the tide dropped away from the creek and watching the wildlife. 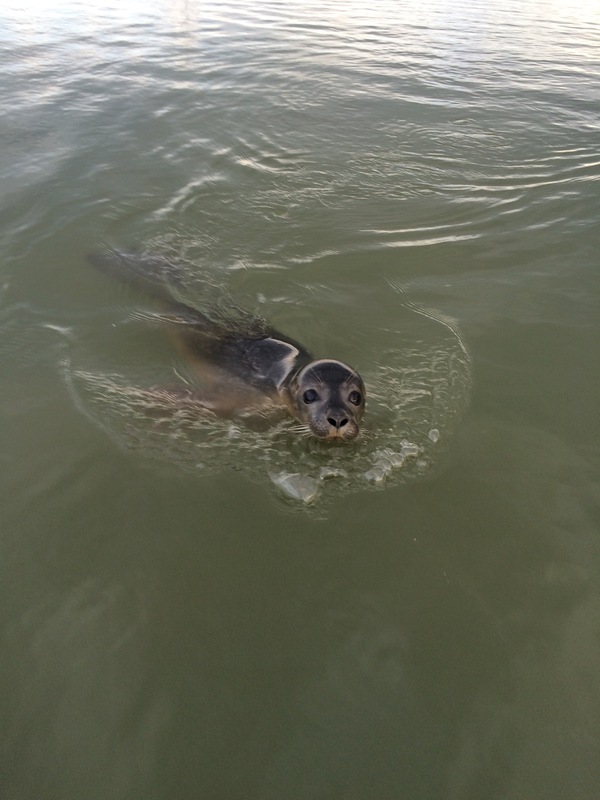 A friendly seal showed some curiosity to us, swimming up to the boat and inspecting our anchor, though I don’t know if he offered us any advice. It was only a pup and repeatedly surfaced right at the stern of the boat snuffling loudly and then diving under the boat again; it’s a shame the water is so muddy that you cannot see under it. The seal pup spent slot of time sticking its head out of the water and looking at things (not just us, but birds flying overhead or walking on the shore). We made a lovely chorizo and kidney bean hotpot for tea in the thermal cooker- it was one of those recipes that evolved from the ingredients which emerged from the cupboard; the sun managed to look out from behind the clouds, allowing us to eat our meal in the cockpit. 6.6nm travelled; avg speed 3.3kt. The internet has made it normal to have a (typed) conversation with someone you rarely, or never, see in real life. 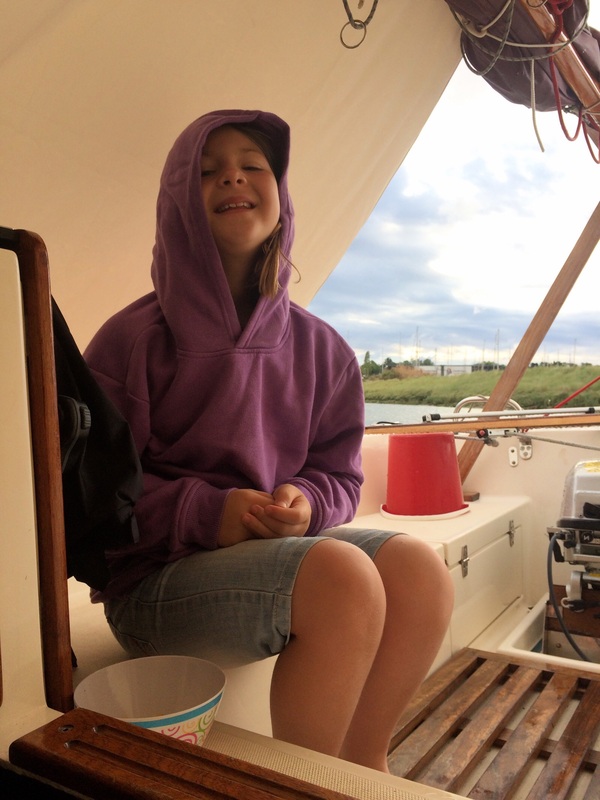 On seeing the poor weather forecast for our holiday, we had changed our plans from North Devon, to the East Coast and I posted a question about locations on the Essex coast in a sailing forum. I am always amazed (and grateful) that total strangers would take the time to type responses to my questions about matters such as launching a boat on Essex rivers. On this occasion, I received quite a bit of help from one particular member of the the forum, which ended up with us beginning this trip at North Fambridge. 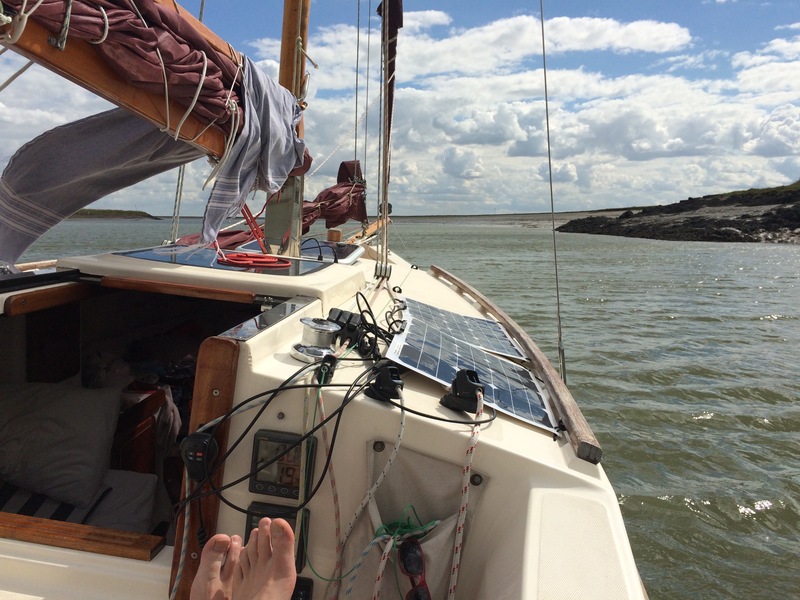 We knew the weather was going to be poor for a few days, and so spent two days ashore. The outlook was still not good for the next couple of days either, and the options looked limited. One advantage of being so far up river is that there is plenty of shelter and this time there was the added bonus that even though old boots were literally being blown about the boat yard, a trip downriver would be also downwind. 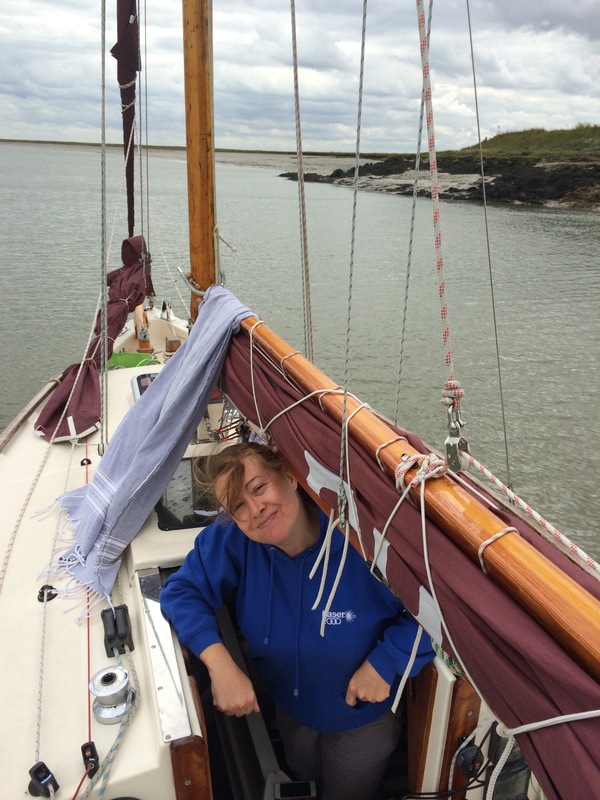 We set off, without the kids, and followed the ebbing tide using the staysail only. The countryside around this part of the river Crouch is rolling and very attractive, but it did not look at its best in the current weather. Even so, we had a lovely lunch with the countryside flowing past the boat. We clipped along above 4kts the whole way and were soon in Burnham; I had chosen the marina, as it gave the best shelter and was only a short walk from town. We spent the afternoon wandering in town; Burnham is very attractive, as it has almost no “chain” stores and yet avoid the twee antiqui-ness of other similar places. It also has two chandleries, always a plus in my book. 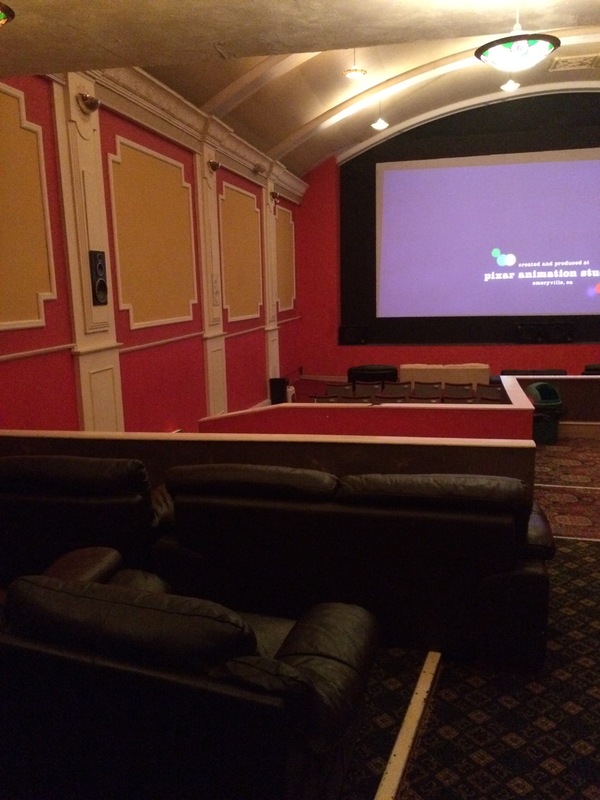 The independent cinema is worth a visit on its own but, though I had enjoyed taking the kids to see a film there yesterday, we didn’t go again today. I decided to try out my new kite-cam kit this afternoon too, given the steady wind. However, the kite was much too big for the f5-6 and after a few minor cuts to my hands from the string and breaking my reel, I had to admit that it was too windy for that too. 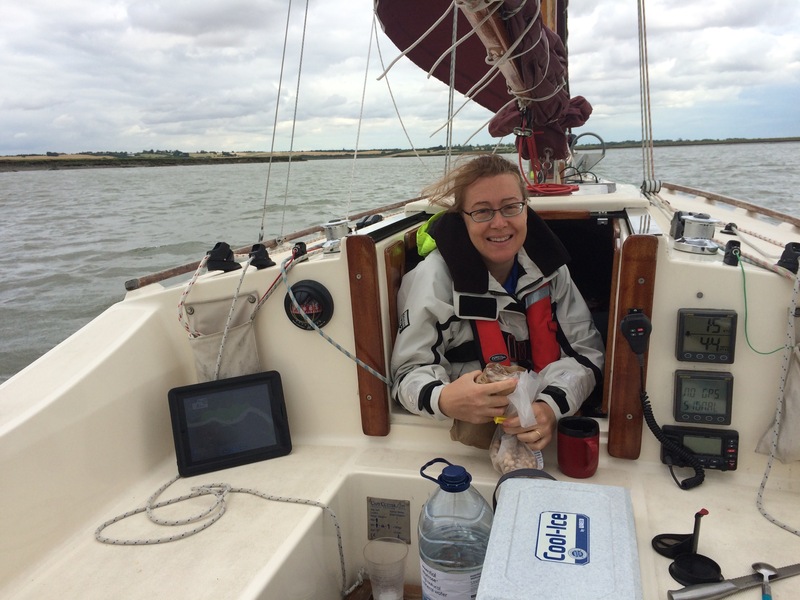 We had a quiet evening aboard, cooking a curry and watching the Americas Cup on the iPad. The wind is forecast to drop off tomorrow. 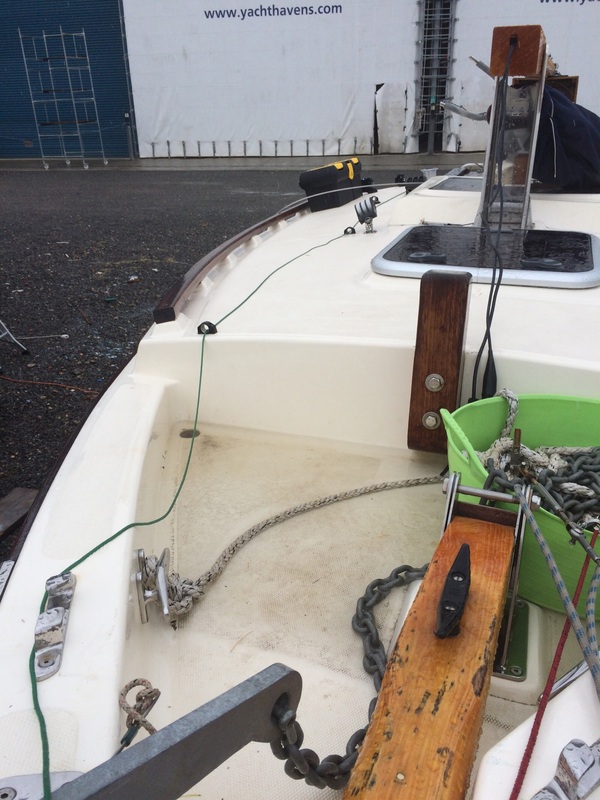 A big advantage of a trailer sailer is that it’s easy to change plans. Our plan for this trip was to visit Lundy, but it was not to be. The forecast for the whole week was poor and, so we started looking at where the best weather was forecast. It turns out that the weather is not predicted to be good anywhere, but the East coast seemed least worst. We have spent several trips in the Suffolk rivers, and I was interested in venturing further South into the rivers of the Essex coast. This has the benefit of good shelter and a number of marinas. We decided that, with a wet and windy weekend forecast, we’d use the boat as a floating caravan. 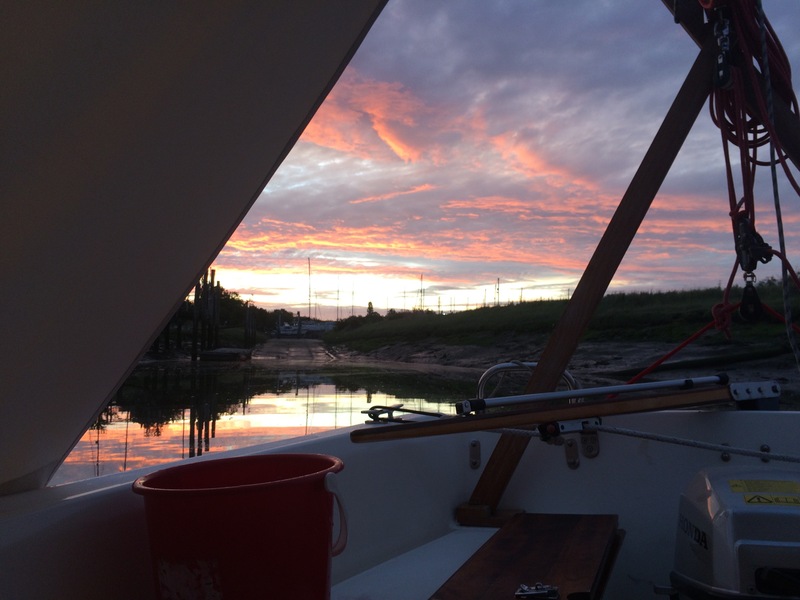 Fambridge Yacht Haven was our chosen base, with easy road access, good shelter and a tractor launch included in the slipway fee. After an uneventful drive, we arrived in steady rain. Niki and the kids took shelter in the cafe, whilst I rigged the boat. Given the weather, a swift and easy launch by tractor was much appreciated. We drove to Burnham for dinner, eating the Sgt Pepper 60’s themed restaurant. Plans were hatched for a weekend ashore- a trip to London in Saturday and visiting relatives on Sunday. The rain cover was pressed into service and it was pleasant to lie in a bunk, listening to the wind and rain. The cover, though not perfect, allows us to sleep with the washboards out, so the interior doesn’t get too humid.